In which Kalkette has many adventures with yarn and needles and hooks and some other crafts may also appear. 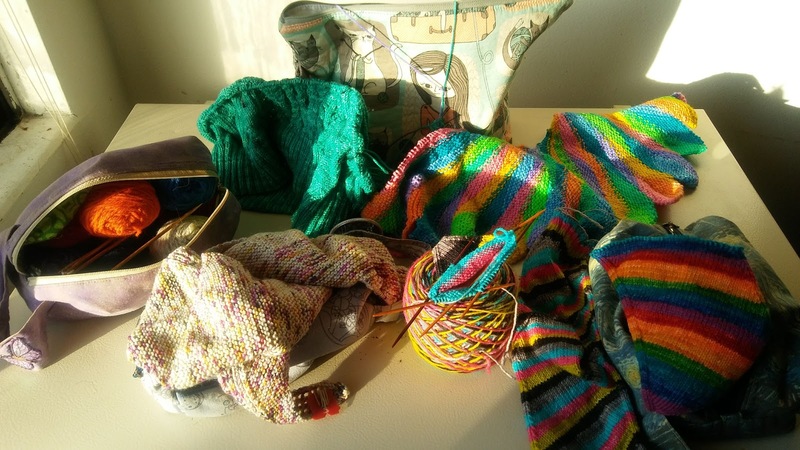 With the start of a new year, I felt compelled to take a look at what I'm knitting and think about whether I will finish or frog some things. I didn't go digging deep in the UnFinished Objects (UFO) bin (which is considerably lighter thanks to my finishing fest this fall) but just looked through the items sitting out and being worked on. Well, at least most are being worked on. You'll see. I ended up with this. A total of 6 projects. I know all of these will be finished eventually because I like them, so I took a look at what I had. This is the Skew sock I've mentioned before in Vesper Sock Yarn 'Happy Accident' I managed to finish the first and I've started the second. I know these will get finished in a fairly timely manner since I'm really enjoying them and I want the socks. 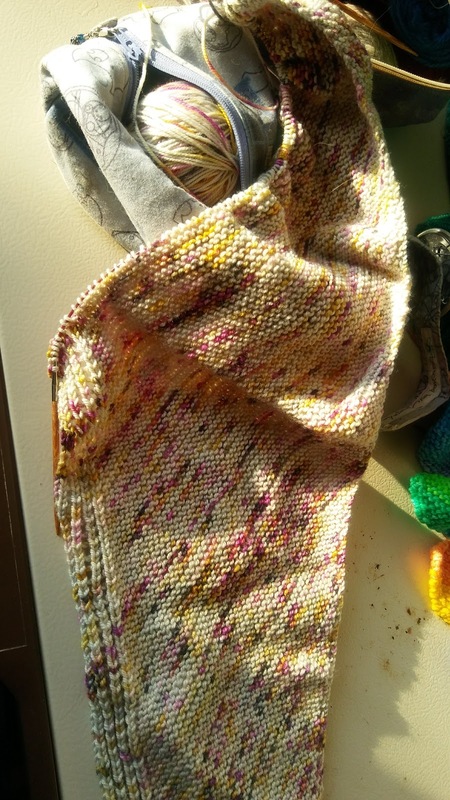 This is another Skew sock that's been started from some Vesper Sock Yarn as well. Except I increased to a larger number. 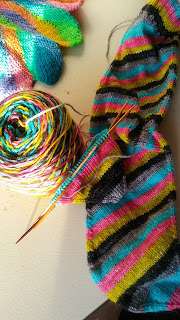 I can't remember if I was going to try to work out the pattern to accommodate that larger number or what my plan was but I actually removed the needles from these in order to cast on the other Skew socks. So, these will likely be knit as well but obviously not until the others are finished since I need the needles. 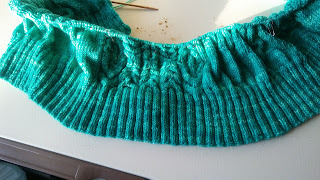 And I will likely rip back and just go with the usual number of stitches rather than trying to work out the pattern. It's a little complicated and I'm not sure I want to put that pressure on myself. Next up is this lovely bit of business. It's my Knit Night Trillian in some Ella Rae Merino Sport. I love how it's knitting up and the speckles looks so great with this pattern. I stopped knitting on it because I was slightly disappointed that it would be so small, really a shawlette more than anything and I debated trying to find more of the yarn. I've decided to finish it anyway (without more yarn) because I think it will still be a cute little neck wrap and I wear things like that all the time to work so it's just a matter of finishing now. Another Shawlette comes in the form of my Pincha. This is being knit from some Vesper sock yarn as well in 'Sometime in April.' I really love how it looks but this pattern requires me to pay close attention all the time so I've been struggling to find the time and focus to work on it. I definitely do want to finish it though. 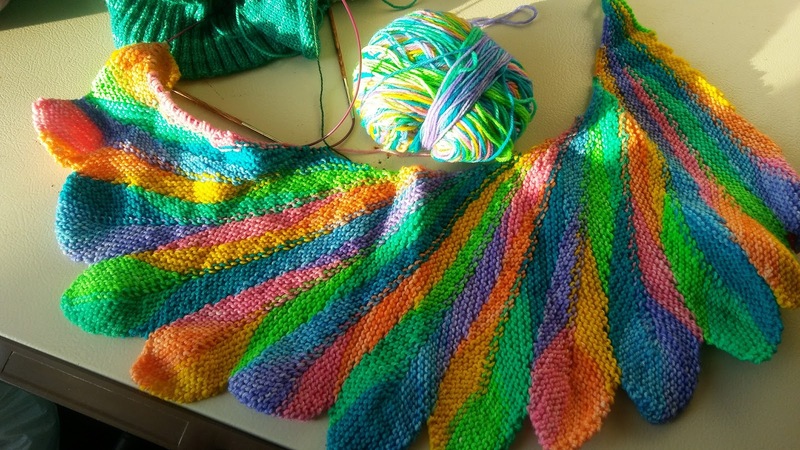 This lovely shawlette reminds me of the feathers of a tropical bird and I think it will be just the thing to brighten up cold winter days. I do have one larger project in the works as well. 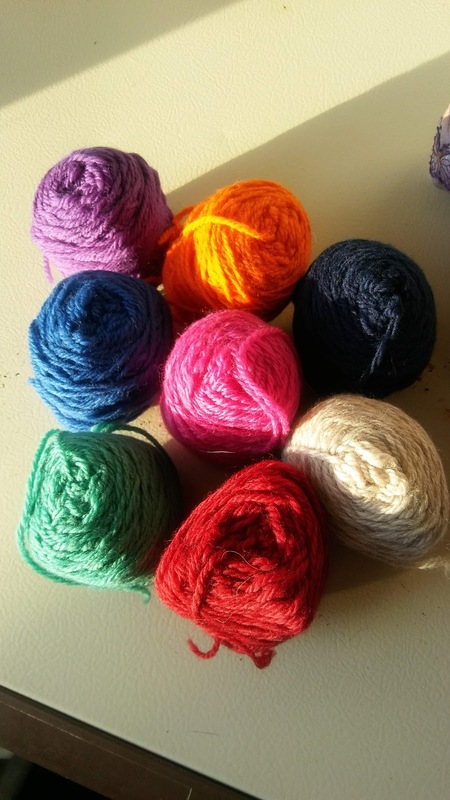 It's been on the needles for quite some time and largely gets ignored. 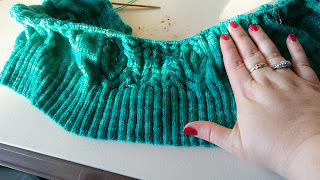 It's another project that requires some attention for the cable and lace panel. It's my Ishnana Cardigan by Ysolda Teague. I'm knitting it from this gorgeous color of Knit Picks Hawthorne in Poseidon. I have a long way to go as you can see, it isn't even as long as my hand yet. But I know that I want to finish this so I will keep working on it when I can. Last but not least isn't even on the needles. These are the mini-skeins meant to become the Chevron Love Mittens. I had cast them on at one time and didn't like the way I was working the colors so I ripped them out. I haven't cast back on yet but I want to and now is the time for mittens. I could use a pair of lovely warm mittens. So there you have it, my current projects. 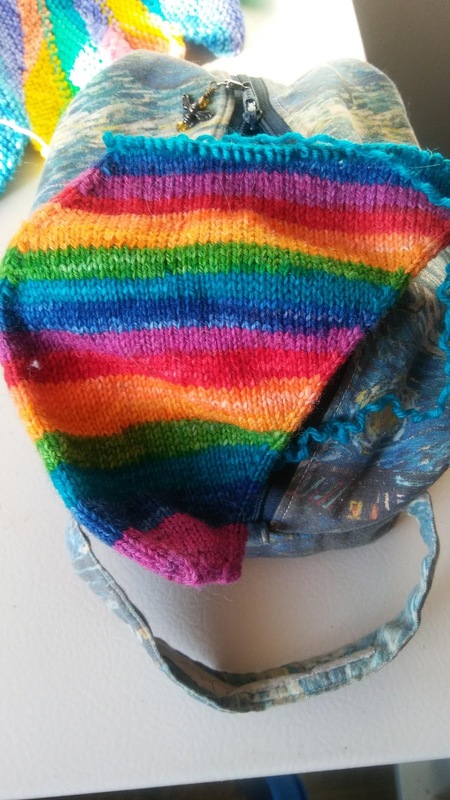 (Although I didn't include the purse sock I cast on so I could take the Skew socks out of there.) Hopefully in the coming weeks, or maybe months, you will see some progress on these. Maybe even some finished items. It really helped me to take a look at what is in my UFO bin though and get my head around what needs attention. It feels manageable and made me realize that I have some lovely things I want to finish. So, hopefully, I can get on that. Do you periodically dig through your UFOs and have a finish or frog it party?